On Sale Now! Free Shipping Included! 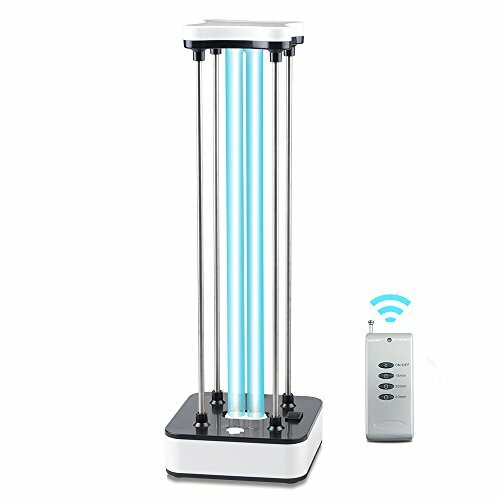 Save 4% on the BRIGHTINWD Ultraviolet Germicidal Light Quartz Lamp 110V 36W Air Sterilizer Cleaner Kills Mold Viruses Physically -with 15s Delay Time Remote Control for Living Area (Without Ozone) by BRIGHTINWD at Humble Opinion. MPN: UV Lamp 36W. Hurry! Limited time offer. Offer valid only while supplies last. 【Safer to use】This ULtraviolet Light with a 20M remote control distance, 3 gear timing function and 15s delay timing, it will start working 15s later after operated, without ozone, kill Mold, Bacteria, Germs, and Viruses Physically.Can better protect your families! 【Differencrs between with ozone and without ozone】UV light destroys the DNA of germs eliminating their ability to reproduce. Ozone enhances killing efficiency and odor elimination.UV is a physical reaction,Ozone is a chemical reaction, Ozone reacts with harmful substances and converts them into harmless carbon dioxide, water and oxygen.UV can only kill bacteria where light reaches. Ozone can kill bacteria everywhere. 【More suitable for living area】 People always put quilts, clothes bask in the sun to kill germs. With our UV lamp, you can kill gearms anywhere at any time. Even in the evening, in winter. Easier to use in baby room, the air within the elderly room, kitchen, bathroom, bedroom, school, hotel,office,on public transportation, and in other public places. 【Advanced UV-C technology]】 makes it possible for this sanitizing travel wand to destroy more than 99% of bacteria and viruses within seconds. For your safety and protection, this disinfectant does not contain any chemicals. 【Pay attention】Ultraviolet radiation can cause skin and eye burns, please pay attention to the protection. Avoid long term direct exposure on human body. If you have any questions about this product by BRIGHTINWD, contact us by completing and submitting the form below. If you are looking for a specif part number, please include it with your message.